3-12-2K7 Basics of Computer Design. Performance Measures. 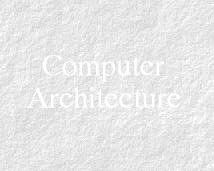 Instruction Set Architecture (ISA) Characteristics and Classifications. CISC vs. RISC, The MIPS64 ISA. 3-19-2K7 Exploiting Instruction-Level Parallelism (ILP): Basic Instruction Block, Loop Unrolling. Further Classification of Instruction Dependencies: Dependency Analysis and Graphs. 3-26-2K7 Dynamic Hardware-Based Instruction Pipeline Scheduling: The Scoreboard, The Tomasulo Approach. 4-4-2K7 Fundamental Dynamic Hardware-Based Branch Prediction Techniques: Branch-Target Buffer (BTB), Single-level, Correlating Two-Level, Gshare, and Hybrid Dynamic Branch Predictors. 4-9-2K7 Multiple Instruction Issue, CPI <1 Approaches: Superscalar, VLIW. Speculative Tomasulo Algorithm. 4-16-2K7 Data Parallelism & Loop-Level Parallelism (LLP) Analysis. GCD Test. Software Pipelining. FYI: Brief Introduction to Vector Processing. 4-18-2K7 Review of Memory Hierarchy & Cache Basics (from 550). 3Cs of Cache Misses, Cache Write Strategies & Performance. Multi-Level Cache. 4-30-2K7 Input/Output & System Performance Issues. 5-7-2K7 The Memory Hierarchy: Main Memory Issues. Performance Metrics: Latency & Bandwidth. DRAM System Memory Generations. Basic Memory Bandwidth Improvement/Miss Penalty Reduction Techniques. This page is 26Kbytes long and was last modified on: Monday, 25-Feb-2008 17:16:59 EST.